The top things to do in Singapore is brought to you by a friend and fellow travel blogger Maria Alexandra from LatinAbroad.com. Here she is going to share the best tourist attractions in Singapore. A Singapore stopover, a country where “East meets West,” is bound to be unique due to its deeply-embedded multiculturalism alone. By the 7th century BC, Malay, Indian, Chinese, Javanese, and Arab traders already considered this island nation a globally-strategic hub. The subsequent arrival of the Portuguese and British Empires between the 16th and 19th centuries only added to its diversity, bringing with it a wave of migrant workers from Southern Asia as well. Instead of conflict, the opposite occurred. 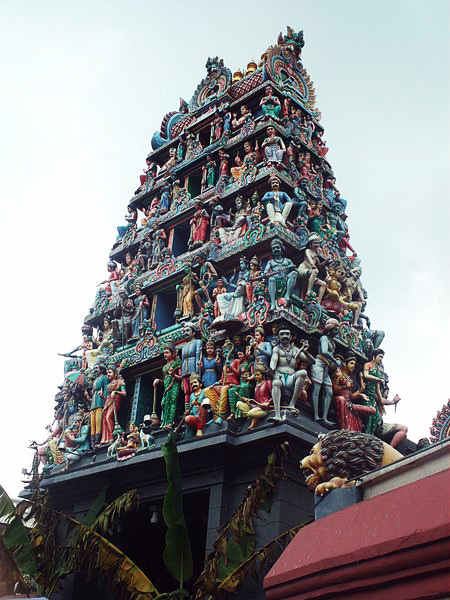 Modern Singapore is a thriving secular country—heavily emphasizing respect for different religions and beliefs. The best news for travelers in-transit, though? While wildly diverse, Singapore is quite compact. add to that excellent infrastructure and modern underground system and you have all the ingredients for an eventful stopover. 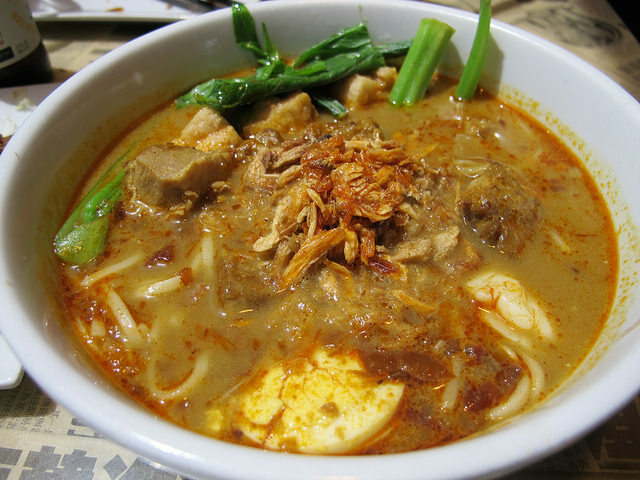 Enjoy the most popular attractions in Singapore below starting off with some of the delicious food! In a country were eating is considered a national hobby, a foodie walk through historical neighborhoods and hawker centers is a must. On your plate could be anything from Hainanese chicken rice and pork Hokkien mee to halal Tamil curries and pickled Malay vegetables. After giving Singapore’s unique fusion cuisine a try, dig little deeper into its historic neighborhoods for architectural and religious gems. One of the unique things to see in Singapore is the cultural diversity. It seems as though the entire world merges in the city. Some special temples and districts in these areas stand up beautifully against their backdrop–a contemporary concrete jungle. Founded in 1887, the luxurious colonial hotel not only boasts 103 suites, but it also has over 40 upscale boutiques to shop at and even an arcade. There are also roughly 18 different restaurants and bars. 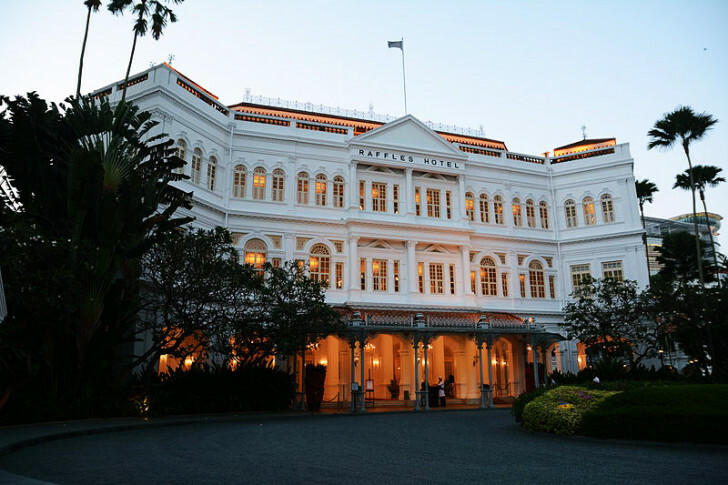 Indeed, the Raffles Hotel could keep you entertained throughout your entire stopover in Singapore! Of all the best tourist attractions in Singapire the Marina Bay Sand’s Hotel has to be a priority. At 57-stories high, the infinity pool at the Marina Bay Sands Hotel is the highest in the world (and one of the most amazing). As such, it affords travelers absolutely spectacular sunrises and sunsets from a unique perspective. Moreover, the hotel boasts some of the best rooftop bars in the entire city. 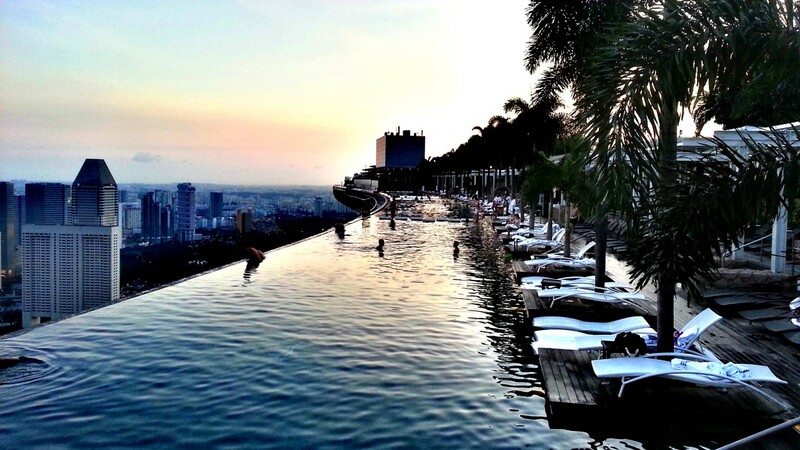 Please note: You must be a hotel guest in order to access the rooftop pool. For this reason, a one-night minimum stay in Singapore is required to enjoy this attraction. Not enough time for a swanky hotel stay? 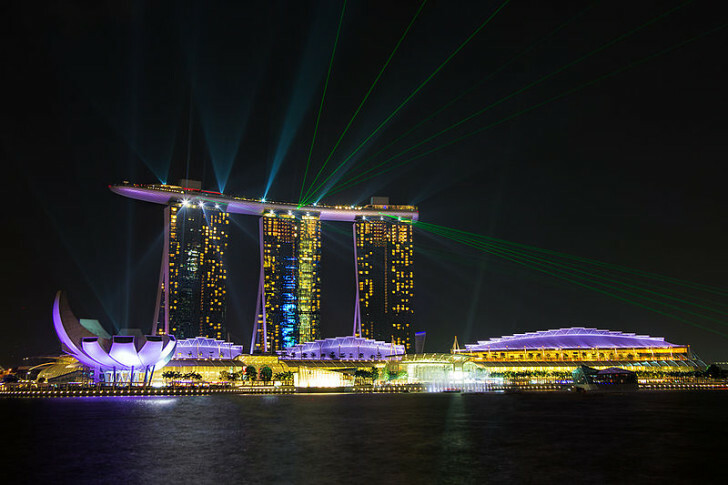 Take a stroll down Marina Bay around 10 PM nightly to be delighted by a special light show. Here you will be able to see one of the other popular attractions in Singapore which is the iconic Merlion. The set of rhythmic lights illuminate both the water and several landmark buildings in downtown. Cheesy, but fun! If you haven’t noticed many of the things to do in Singapore are mostly man made structures. Singapore is one of the smallest countries in the world. Luckily, they have a unique vision and tons of creativity to create these incredible man made objects. 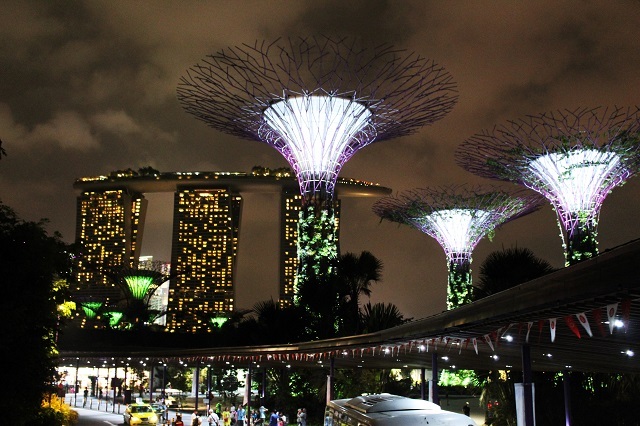 Speaking of light shows, another fabulous thing to do in Singapore at night includes Skywalk. As the name suggests, the aerial walk attraction is connected to the giant trees at Gardens by the Bay, offering you fantastic views of the skyline and lit-up gardens. You can also dine and wine at SuperTree by IndoChine — a chic rooftop bar conveniently located on top of the highest SuperTree at the Gardens. I absolutely loved Singapore’s diverse nightlife. My biggest surprise and delight, though? Finding some incredible live Latin bands and great dance scene at a couple of clubs in Clarke Quay! Check out what’s cooking the week you visit — there’s also Top 40s, hip-hop, and other types of dance bars and pubs within this beautiful riverside district. 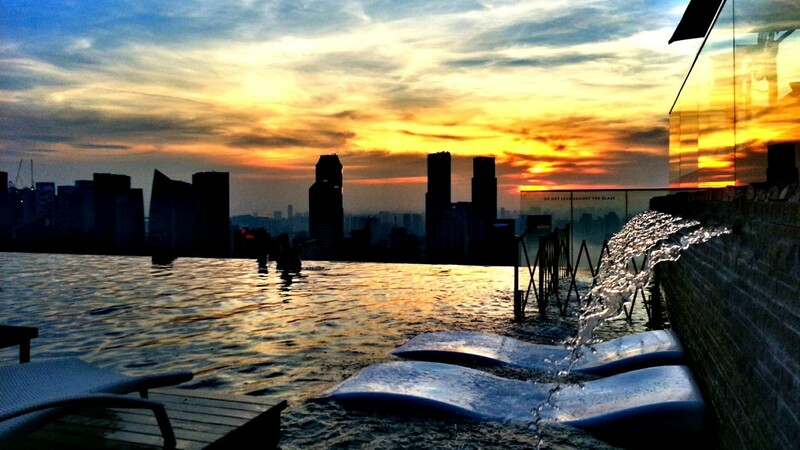 Not your first rodeo or simply looking for off-the-beaten-path attractions in Singapore? Take these unique side trips and explore parts of Singapore many travelers in-transit don’t ever see. Singapore’s foodie scene is thriving with new chefs and creative twists on both heritage and international fair. 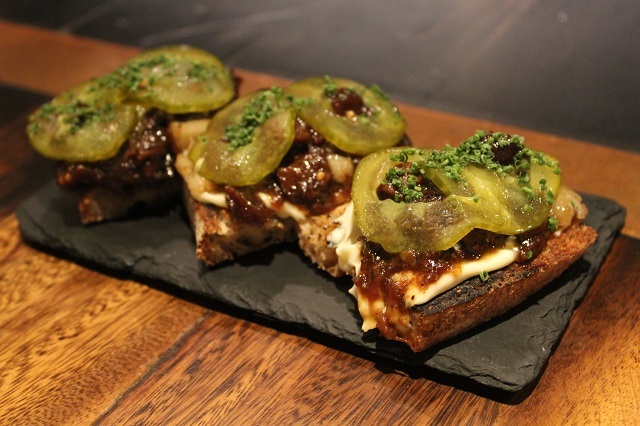 Unique cocktails, small plates, and exclusive spots can be discovered through a Culture Bites bespoke tour. Being completely customized, you can either book a few hours or a multi-day rendezvous. I went on a 6-hour my jaunt around downtown with James and let me tell you: I never thought I would have the best pulled pork sandwich of my life in Southeast Asia! Island hopping is one of the top tourist attractions in Singapore! That was also my initial reaction when a Couchsurfer suggested this day trip! The retreat from the city ended up being one of my favorite attractions of the island nation. Easy peasy to get to as well. 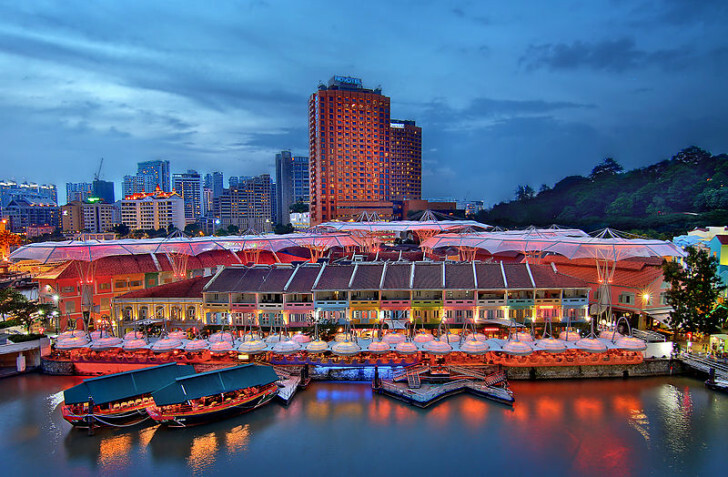 Simply get to the Marina South Pier either by taxi or Metro, then buy a ferry ticket at the counter to visit St. John’s, Lazarus, and Kusu Islands. For USD $18 per adult or $12 per child under 12 years of age, you get to explore the beaches of these outlying islands. Your ferry ticket is good for a full day, within operating hours. Definitely one of the things to see in Singapore! 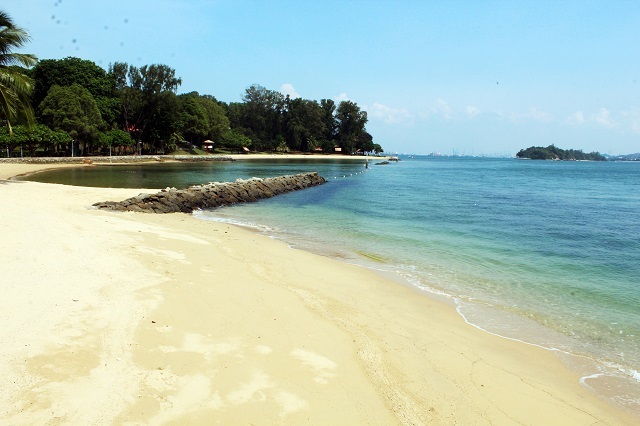 Sentosa Island is not only another day trip to escape the concrete jungle, but also a great place to party. There’s always something exciting going on: either mid-afternoon or wee hours of the morning. 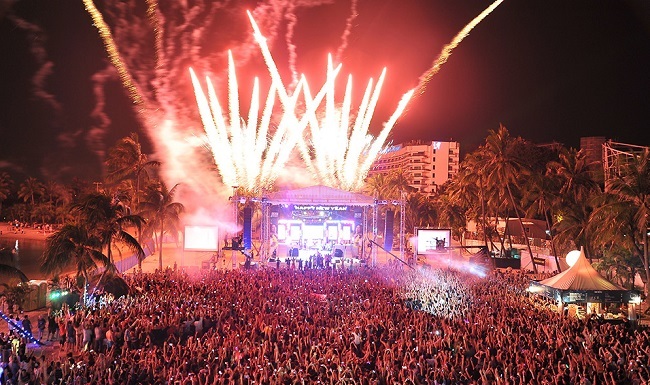 The most popular spots include the Tanjong Beach Club and Azzura Beach Club. I was just in Singapore a few months ago! Absoloutely loved the city. I always thought NYC was the most cosmopolitan city int eh world but after visiting Singapore, I have to hand it to them. The food was delicious but actually cheap. Best of all, it’s close to everywhere in SE asia and it’s just a cheap $50 airasia flight away! I used to live in Singapore and you picked some great examples of what to do in Singapore! Mustafa Center and Tajong Beach Club are some of the less known places well worth visiting! Who ever said Singapore was boring? Great list of things to do here … too bad you have to be a guest to use the pool at Marina Sands, but there’s a good reason for that! Thanks for these great recommendations! I’m traveling to Singapore two weeks from today and need any tips on what to do when I get there! I’ll be there for three days and would love to check out the various food tours, Marina Bay, and Sentosa Island for nightlife and fun! Singapore is such an interesting country with so many things to do. I’m glad you enjoyed Singapore and have tried interesting things to do. I like to travel to Singapore, how difficult/ easy will it be having MS, therefore walking disability and have a smart small Rollator, Nordic walking sticks and a small wheelchair to allow me to get around?